What People Are Saying About: Jewell | Crystal Water Villas Blog - Lake of the Ozarks! Private lake-front cabin resides on an open cove. This redecorated private lake-front cabin resides on an open cove (1-mile marker of the Gravois Arm) and is a favorite for many of our family vacationers. 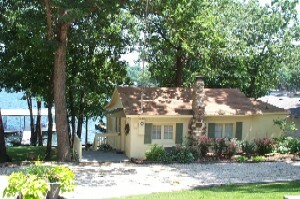 The property includes several shade trees, a natural sand beach, and a private dock. What guests have said about staying about Jewell..